We told you about Amazon’s sweet sale on the AUKEY Latitude Wireless Headphones on Friday, but so many people got in on the action that we wanted to give you another chance to save before this sale ends. 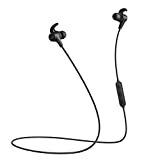 These Latitude earbuds are Amazon’s Choice designated headphones that offer killer sound, three integrated EQ modes, great battery life, and a cool design with a magnetic clasp that keeps them around your neck when you’re not wearing them. They’re obviously worth every penny at $26, but the coupon code L6MWTC6C drops the price to just under $18. That’s a ridiculously good value, but the deal expires on Monday so it won’t last much longer.